LONG BEACH, Calif. – The first time I went to Organic Fork, I ordered a romaine salad, thinking it would be a flagship that goes with the white walls, open kitchen and “healthy food” mantra. But as I sipped on an alkaline-water jamaica-lime agua fresca and stabbed into a compostable bowl of herbal, seed-loaded crunch (which still felt substantial, even without the pricy $4 protein add), I noticed the décor of this homegrown concept’s first location urging me to try something else. “Make Our Abuelitas Proud!” read custom signage hung prominently on the walls. 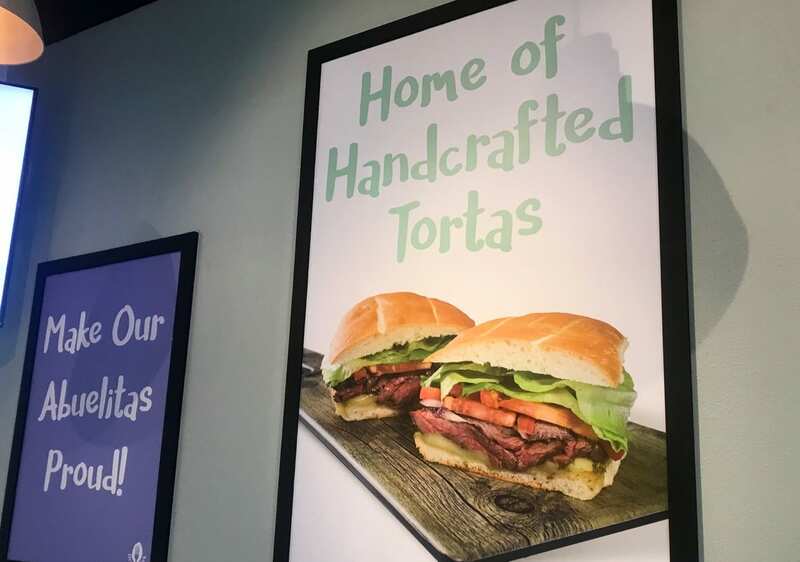 “Home of handcrafted tortas” was printed on another. The new potential franchise is the latest from the entrepreneur behind the Buffalo Spot, which started across the street from Wilson High School five years ago and now counts 15 locations across three states. Organic Fork is also one of the newest restaurants to enliven the once-sleepy Bixby Village Plaza shopping center, which, after beloved Bay Area-based sub chain Ike’s Love & Sandwiches landed last month, is quickly becoming a dining destination in its own right. Organic Fork founder Ivan Flores grew up going back and forth between SoCal and his abuelita’s house in Tijuana and has always wanted to combine his cultural heritage with his own cravings for food that makes you feel good. Once the Buffalo Spot was stable, he searched for the perfect place for his next idea: Mexican-style organic meats and veggies on tortas, plates and bowls, with fast-casual service and prices to match. Instead of rice and refried beans, there’s quinoa and a mix of black and red beans de la olla. In addition to telera rolls, there are gluten-free torta buns. Since June, Flores has been closely eyeing the public’s response to his anti-Chipotle concept—which is decidedly more complex than Buffalo Spot’s wings and fries—and tweaking recipes and presentation accordingly. There’s still no way to mix and match meats to build a sampler plate of sorts (and it feels weird to get more lettuce than vegetables on bowls and plates), but management did change the turmeric-ginger chicken recipe to fix its initial dryness issues and tortas now come wrapped in paper for one-handed eating ease instead of splayed open-faced on a plate. Last month, Flores rolled out a simple-yet-effective breakfast menu and a student-friendly taco special, which at three for $7 is a steal, especially considering the tortillas are often handmade from blue corn and the meats range from an irresistible slow-simmered Duroc pork carnitas to a lean carne asada made with grass-fed, carrot-finished beef. Even breakfast and tacos are no match for Organic Fork’s tortas, though, in which the sustainably sourced ingredients shine on grilled bread that’s been slathered with jalapeño aioli and cilantro pesto. Finding a good torta in Long Beach is as hard as finding a good sandwich—that is to say, very hard!—so you may be tempted to stop there, but keep going. Farther down the menu, a trove of soups and sides make it fun to explore more. I’ve been trolling through the lower-level lineup for weeks now, pulling off the 22 freeway as it careens into Seventh Street for a $3.50 cup of esquites (topped with the proper proportions of mayo, salty cotija cheese and Tajín) and another summer-punching alkaline-water agua fresca. A $4 bowl of bone broth proved useful for its therapeutic properties, but it’s Flores’ earnest attempts to update his family’s homestyle flavors by making them breezy, accessible and all-organic that is truly making abuelitas proud.